Following on from a previous project for Social Care Training, Daffodil Care Services asked us to continue the organisations literature redesign. 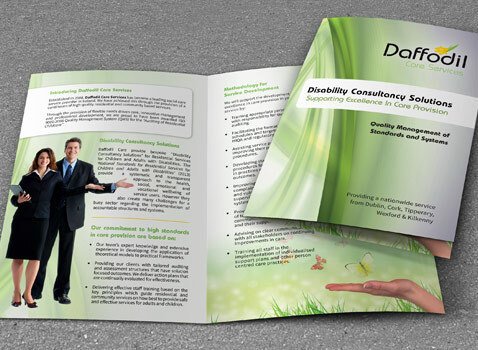 The latest project was redesigning their information booklet while keeping within the organisations branding. Both Social Care Training Ireland and Daffodil Care Services have worked with Kevin O'Sullivan and Alpha Design on a number of design and printing projects. Kevin actively sought our business by providing a very competitive quotation package. It's very difficult to envisage what a brochure will look like on paper when you are looking at a computer screen but Kevin's feedback to our design revisions and his attention to detail were hugely beneficial and assisted us in making the right choices at every stage of the design process. We were consistently impressed with Kevin's professionalism, advice, competence and willingness to go the extra mile in securing the best possible result for our companies. I would recommend Kevin O'Sullivan and Alpha Design without hesitation and look forward to working with him on our next project.